In the New England area reception sites abound  but most popular sites are often reserved more than a year in advance! The wise couple will reserve their special reception location before making any other plans. Many couples have found it is often much easier to book a reception on a Friday or Sunday. Some facilities will even offer special discounts/incentives for receptions held on days other than Saturdays. When it comes to choosing a reception site, types of facilities vary greatly. 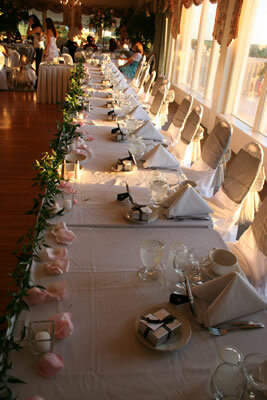 The deciding factor for most weddings is usually the number of guests the facility can accommodate. Budget and location are the next important factors to consider. For those on a tight budget, the church hall is an affordable reception site that offers convenience as well. Many clubhouses, operated by organizations including the American Legion, Veterans of Foreign Wars, athletic, ethnic clubs and service organizations are often available for receptions. These "clubhouses" vary from casual to formal upscale and their fees range accordingly. City, county, and state parks offer natural settings appreciated by many, as does your own backyard! With the help of a tent rental company your reception can be "covered" come rain or shine! Hotels, catering halls, country clubs, university unions, museums and restaurants are some of the most popular sites for receptions. These venues can range in capacity from intimate parties to grand affairs. 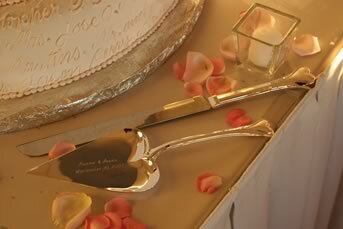 The wedding couple must determine an approximate number of guests to be sure the location can accommodate their needs. Each site has its own size and style and therefore prices can vary a great deal. Reception site managers all agree that the first piece of advice they make to couples looking for a reception site is to know their budget. Other things to keep in mind are whether the site can accommodate parking needs, dance space, and music requirements. What are the policies on beverages, food and catering services, time restrictions and decorations? Are tables, chairs, linens, silverware and other accessories provided? Check on rental fee, deposits, and date guarantees. It is important to view the facility to make sure you are getting what you expect. Ask to see the facility when it is prepared for a wedding that is similar to how yours will be set up. Discuss any special needs you or your guests may have with the banquet/site manager in advance, the day of the wedding will be too hectic to deal with any of the details! Alternative ideas to the traditional reception site can include city, county and state parks, or one's own backyard. While some parks have shelters available in case of inclement weather, others rely on the rental of tents as shelter. (Since each park has their own restrictions and rules, it is vital that the couple knows well in advance, what they can and cannot do). The use of a tent combines the feeling of the great outdoors with protection from the elements. Tents come in a variety of styles and can play host to a casual event or elegant gathering. Rental companies can supply beautiful white tents with French window sidewalls, dance floors, lighting, tables, chairs, fountains and more to provide a breathtaking atmosphere for any celebration. Tents are available in many sizes; some can even accommodate over 2,500 people! Professionals in the tent rental business can help choose the size and style that will be best for the event. The great outdoors also provides many options in food choice from picnics to formal sit-down dinners. Caterers can be hired or the do-it-yourselfer can turn to rental companies for food service equipment and portable bars. When choosing an outdoor venue there is one more thing to keep in mind, the need for restrooms. Some companies that carry portable restrooms will rent them for special events. Companies that specialize in the business may surprise you. Their units are clean and can come equipped with flushing toilets, sinks, mirrors and lights, providing all the conveniences of an indoor facility in the outdoors! In this area, many facilities are under contracts with specific caterers. This means that when a reception facility is chosen, the facility may dictate who will provide the food. If a facility is chosen that lets the couple choose their own caterer, a delectable variety of caterers are available from which to choose. The first toast is proposed by the best man after the wedding party has been served and is usually followed by toasts from other relatives, friends or the bride and/or groom. The newlyweds' cake-cutting is always a crowd pleaser. After the bride and groom feed each other a small piece, their parents receive pieces before the guests. The first dance belongs to the newlyweds. This solo dance focusing on the bride and groom is traditionally a waltz. A contemporary approach can entail a special song, choreographed routine, or any dance of the couple's choice. The wise bride and groom won't wait until the last minute. It takes time for a professional to help enhance this first dance as husband and wife. Couples may consider going for professional dance lessons a few months before the wedding to learn the basics of some ballroom dance steps. There's nothing more impressive than when a wedding couple looks graceful on the dance floor. The newlyweds' solo dance is followed by the bride dancing with her father, the groom's father and the best man. The groom dances with the bride's mother, his mother and the maid of honor. Other guests join the wedding party on the floor after these customary dances. Tossing the bouquet over her shoulder to a waiting group of single women, the bride joins with tradition to appoint the lucky recipient as the next bride. Removing the garter from the bride's leg and throwing it to a gathering of bachelors is also traditional, with the bachelor catching the garter (thrown by either of the newlyweds) designated the next groom. People will often clink their glasses to make the bride and groom kiss during the reception. As a twist on this tradition, announce that wedding guests will have to stand up and sing a few lines from a song that contains the word "love" in order to entice the newlyweds to kiss.